1 Analysis of daniel goleman’s “what makes a leader? Daniel Goleman opens his article with a quick reference about a leader who “fails” and a leader who “soars” when given similar opportunities. 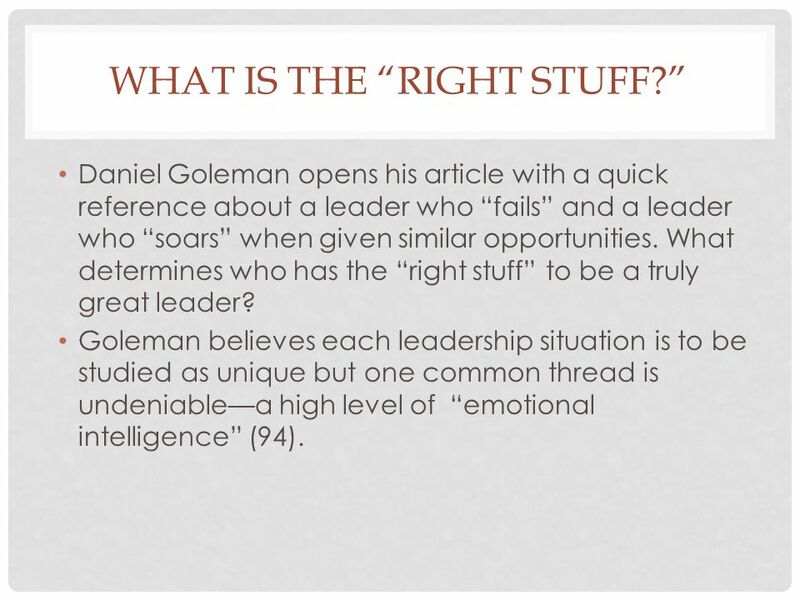 What determines who has the “right stuff” to be a truly great leader? Goleman believes each leadership situation is to be studied as unique but one common thread is undeniable—a high level of “emotional intelligence” (94). Don’t discount IQ or practical (“technical”) skills—these are important, too! These are necessary without saying—automatic requirements for a leader in a capacity. 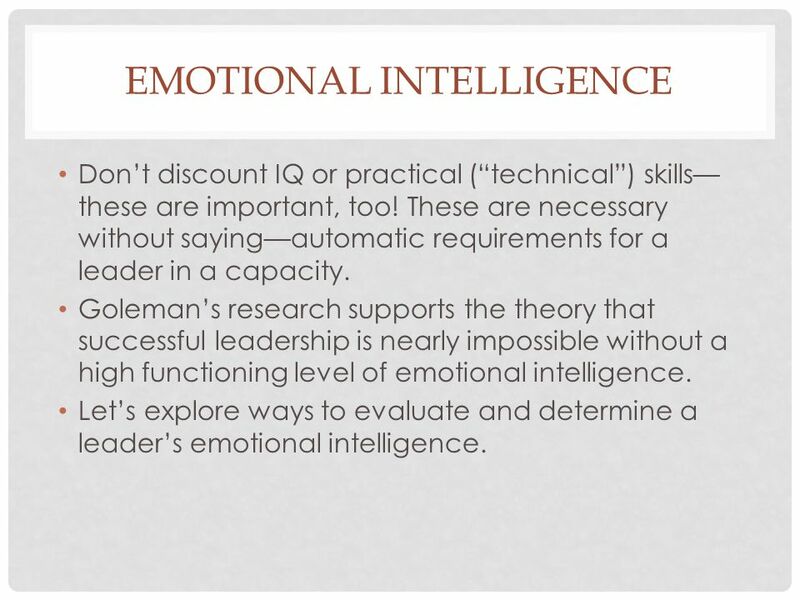 Goleman’s research supports the theory that successful leadership is nearly impossible without a high functioning level of emotional intelligence. 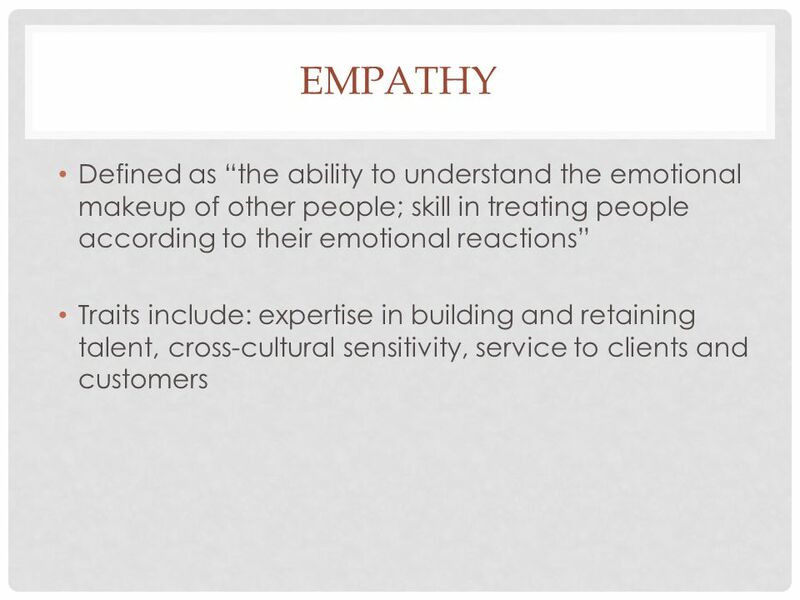 Let’s explore ways to evaluate and determine a leader’s emotional intelligence. 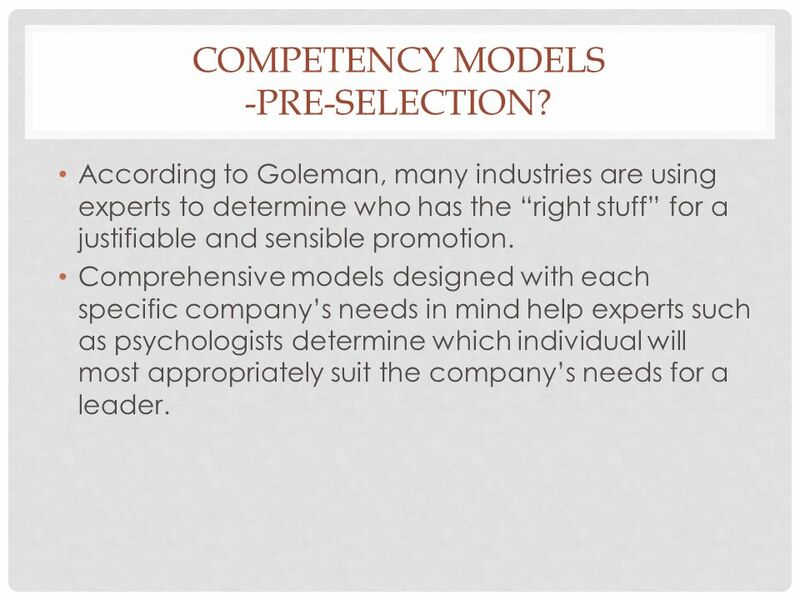 According to Goleman, many industries are using experts to determine who has the “right stuff” for a justifiable and sensible promotion. Comprehensive models designed with each specific company’s needs in mind help experts such as psychologists determine which individual will most appropriately suit the company’s needs for a leader. Goleman’s research suggested emotional intelligence was “twice as important” as other skills such as intellect and cognitive skills (94). As the individual ascended within the ranks of a company, so then did their level of emotional intelligence ratio in relation to their leadership success. 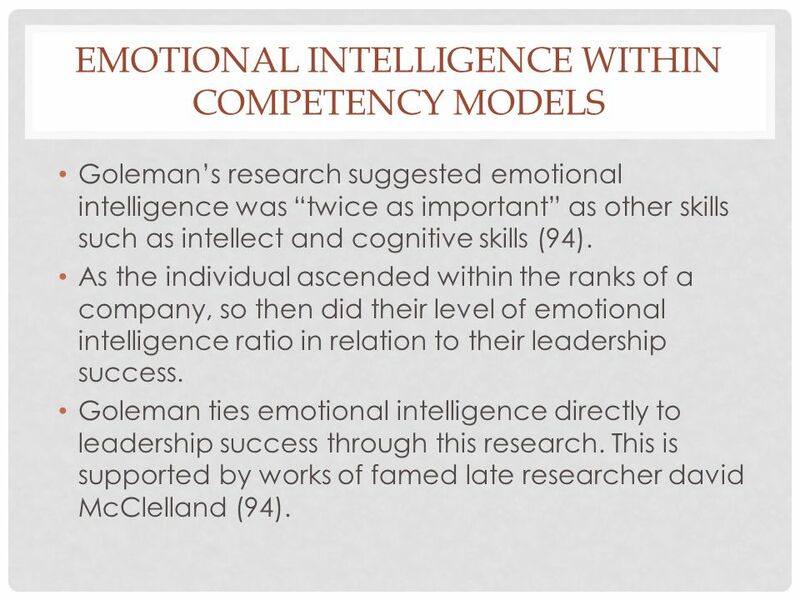 Goleman ties emotional intelligence directly to leadership success through this research. This is supported by works of famed late researcher david McClelland (94). 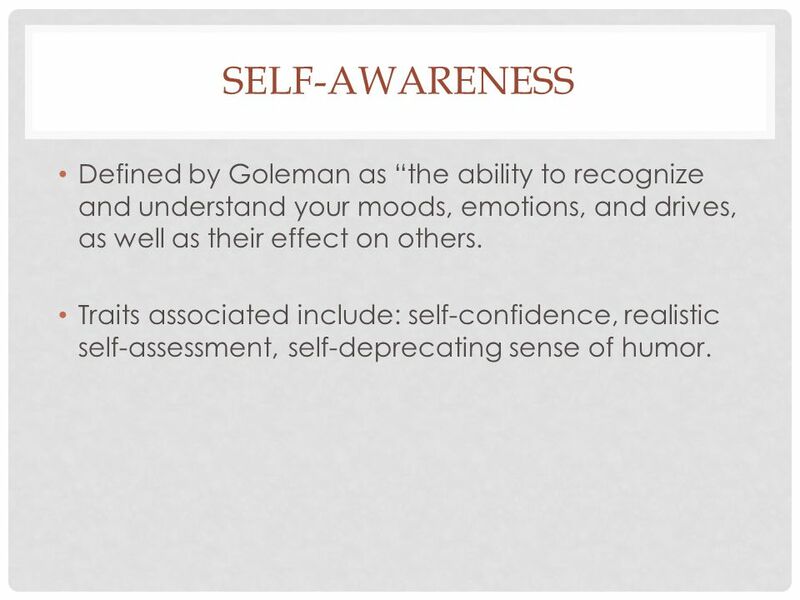 7 Self-awareness Defined by Goleman as “the ability to recognize and understand your moods, emotions, and drives, as well as their effect on others. Traits associated include: self-confidence, realistic self-assessment, self-deprecating sense of humor. 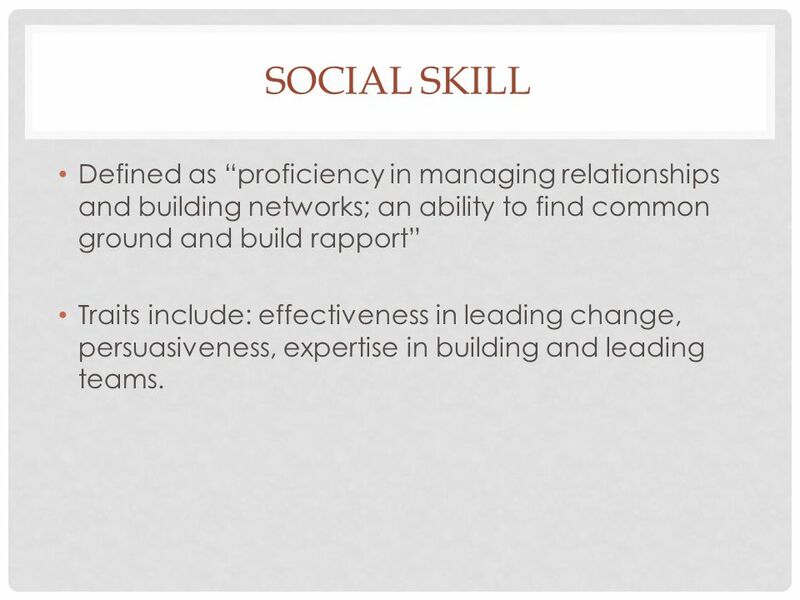 11 Social skill Defined as “proficiency in managing relationships and building networks; an ability to find common ground and build rapport” Traits include: effectiveness in leading change, persuasiveness, expertise in building and leading teams. 12 Innate or learned? 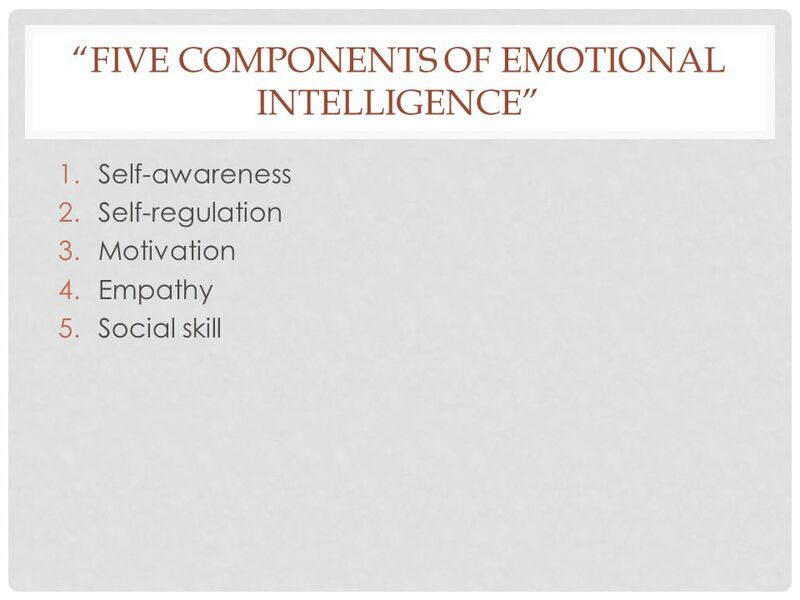 While Goleman makes it clear that there are five key characteristics necessary to possess emotional intelligence, the question of whether this ability can be learned is slightly murkier. 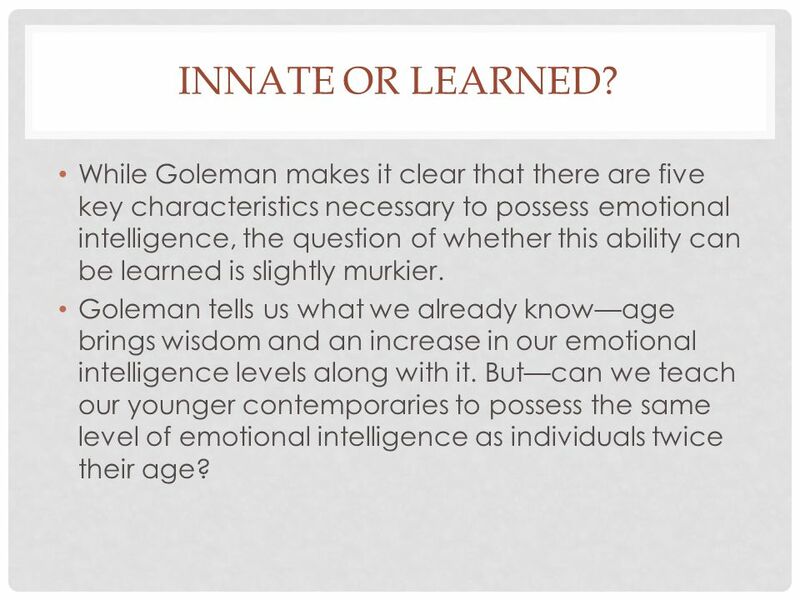 Goleman tells us what we already know—age brings wisdom and an increase in our emotional intelligence levels along with it. But—can we teach our younger contemporaries to possess the same level of emotional intelligence as individuals twice their age? 13 Neurological—but learned as well! 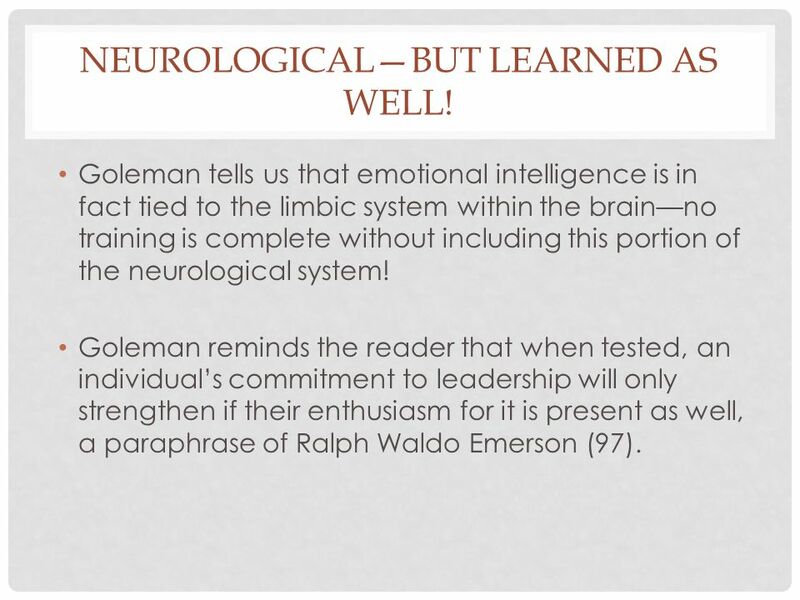 Goleman tells us that emotional intelligence is in fact tied to the limbic system within the brain—no training is complete without including this portion of the neurological system! Goleman reminds the reader that when tested, an individual’s commitment to leadership will only strengthen if their enthusiasm for it is present as well, a paraphrase of Ralph Waldo Emerson (97). 14 Conclusion Leadership is fully achieved through emotional intelligence, which in itself can only be achieved through time, persistence, and commitment. 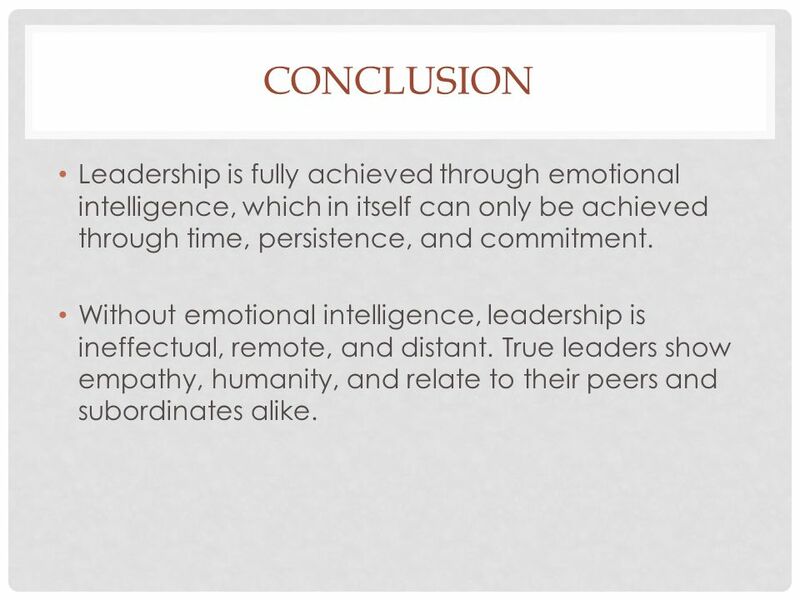 Without emotional intelligence, leadership is ineffectual, remote, and distant. True leaders show empathy, humanity, and relate to their peers and subordinates alike. 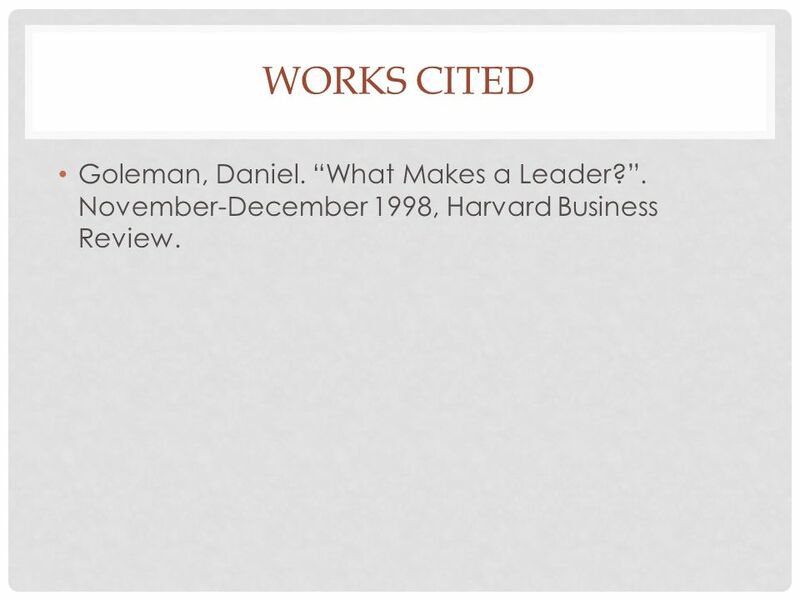 15 Works cited Goleman, Daniel. “What Makes a Leader?”. November-December 1998, Harvard Business Review. 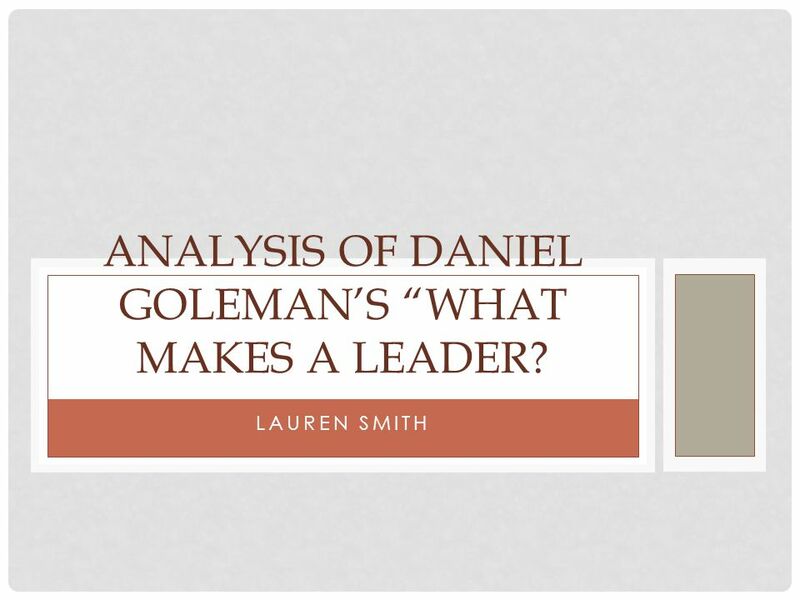 Download ppt "Analysis of daniel goleman’s “what makes a leader?" C-Suite Summit 2013 How To Communicate in Ways That Build Teams, Achieve Results and Influence People - THE CRUCIBLE EXPERIENCE C-Suite Summit 2013 How. Breakfast General Session | People and Change Sponsored by. LEADERSHIP The key to Success Spring workshops, 2012. 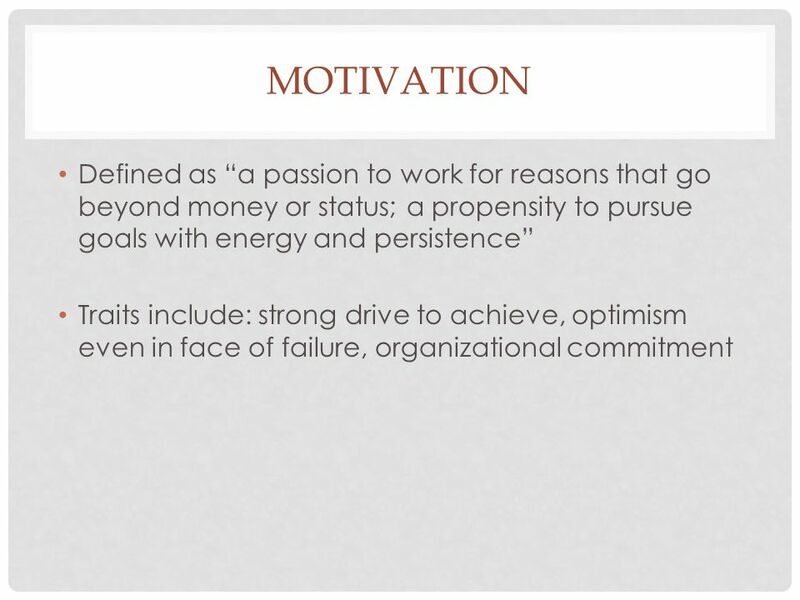 ADM Leadership Lecture 2 – Trait Theory. Description Trait approach one of the first attempts to systematically study leadership. –Great Man Theory. Emotional Intelligence Dr. Neil Katz Executive Education Programs, Program on the Analysis and Resolution of Conflicts Maxwell School, Syracuse University. Kristy A. Brandabur, RMA, CHLC, CBMFC, RA CI7083- Application of Instructional Design and Technology in Medical Education. 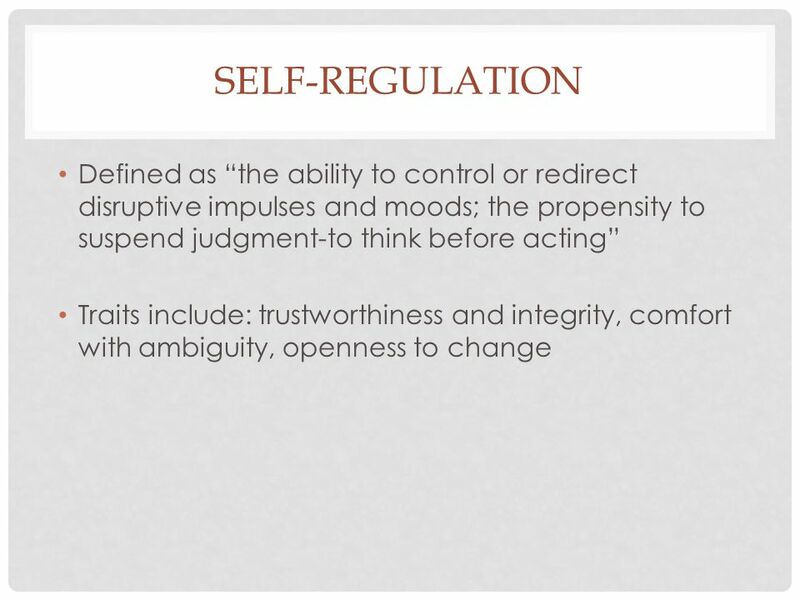 Emotional Intelligence. Group Work Introductions Reflections - Good and Bad Leaders Identify Values and Behaviours Identify Skills. Leadership Workshop (Workshop 1) Date: 24 June 2011 Office of Service-Learning, Lingnan University. CONTENTS What is IQ? Importance of Emotions What is EQ? High EQ vs. Low EQ Ingredients of EQ Uses of EQ Test your EQ Enhance your EQ Why EQ is more. Practicing Emotional Intelligence in the Public Sector IPMA-HR Western Region Conference May 3, 2006 IPMA-HR Western Region Conference May 3, 2006.